Can the Netherlands defend its elections from Russian hackers? 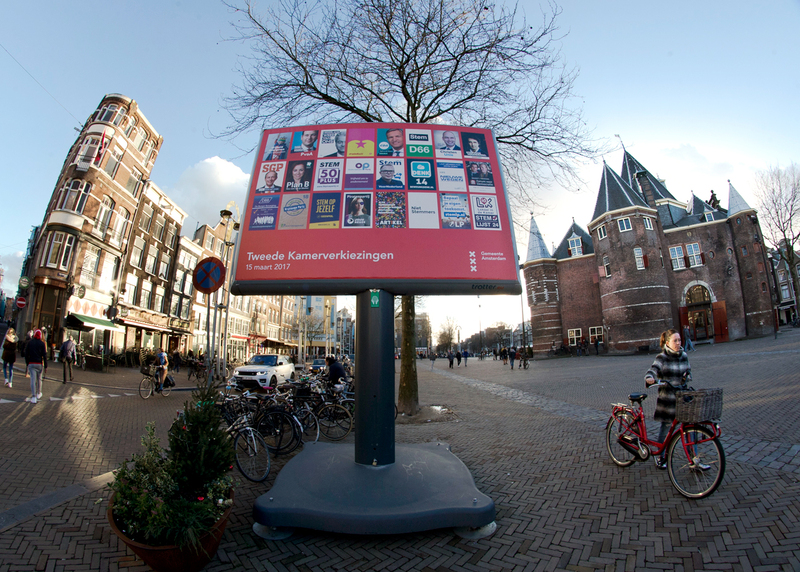 An election billboard is out up in a square in the center of Amsterdam, Netherlands, Feb. 24, 2017. The Netherlands, fearing that Russian hackers may interfere in the country's parliamentary elections in March, has decided to give up using computers to count votes. The results will instead be calculated manually to avoid possible manipulation. In an effort to prevent meddling by Russian hackers, the Dutch government has decided not to use computers during the upcoming parliamentary elections. According to Politico, on Mar. 15, nearly 13 million Dutch citizens will go to 9,000 polling stations to vote for their preferred candidate. To do so, they will mark paper ballots by pencil, after which all the votes will be counted manually. So far, there is no information on how long this will take. The decision not to use computers for fear of cyber attacks was made following accusations that Russia attempted to influence the results of the U.S. presidential election in 2016. This year, elections will also be held in France and Germany, where concerns about cyber attacks have also been raised. So far, however, the measures taken by the Netherlands to protect its elections from hackers have been the most drastic. "There should be no shadow of a doubt about the reliability of the results of the election, especially in the current political climate," Dutch Interior Minister Ronald Plasterk said in February. "At the moment, we cannot trust electronic systems during voting," he added. France, which will hold presidential elections this spring, is also concerned about a possible threat from Russian hackers. Both France and the Netherlands have candidates who are considered pro-Russian: Marine Le Pen and Geert Wilders, respectively. Wilders has been routinely referred to in the European press as “the Dutch Trump." Authorities in the Netherlands are not only concerned that election results could be influenced by cyber attacks. There have also been reports that the computers and email accounts of some Dutch politicians may have been hacked. In early February, the head of the Dutch intelligence service, Rob Berthole, said that Russia had been involved in hundreds of cyber attacks on the country’s state structures that were aimed at stealing classified documents. "I consider this to be a threat to our democracy. The danger is that they (the hackers) will be able to influence the work of the parliament and the authorities’ decision-making process," Berthole said. He went on to add that he did not intend to take any measures since Russia would deny everything. At the time, the official spokesperson of the Russian Foreign Ministry, Maria Zakharova, described the accusations leveled by Western countries against Russia as a "flash mob." "This flash mob is gaining more and more new members. The list of those who have been noticeable recently includes Canada, Norway, Great Britain, the Netherlands, the Czech Republic, Estonia. Listen, we don’t have that many hackers, really," she said. The Dutch government has voiced concerns about possible cyber attacks before. In 2006, a software vulnerability was detected in voting systems, which led the country to ban electronic voting. Voters had to cast their votes the old-fashioned way by filling out paper ballots, although computers were still used to process the data. Ten years later, the Netherlands is still unable to fully protect its electronic infrastructure and has decided not to use computer-assisted vote counting. In January, representatives the Hague Security Delta (HSD), a European security cluster, offered free IT support and lectures on information security for politicians and the Dutch government. A similar initiative was also launched by the Dutch company RedSocks Security. However, according to reports, this offer did not generate much interest and received almost no response from government officials.